Jump In Studio » Highlights from Highlights and Louise Goes to Tulsa! It has been a fantastic and busy season over here in the studio! First off, I helped launch an exhibition of my work at The Highlights Foundation!! How cool is that?? This year, my linocuts from A Child’s Book of Prayers and Blessings will be on display at the barn. I will be back up in July to help kick off Summer Camp at the barn. If you are an aspiring author or illustrator, the Highlights Foundation is a fantastic resource and phenomenal place to hone your craft. The weekend of my exhibit, I was able to invite a few friends up to do some workshopping and brainstorming. I also finally finished the dummy for my next book, Jump In!! What magic. In other huge news, my book Please, Louise, written by the amazing Toni Morrison has been selected as the 2018 Tulsa City-County Books to Treasure Program!! This means that Louise and me get our own library card!!!!!!!!!!!!!!!!!!!!!!!!!!!!!!!!!!!!!!!!!!!!!!!!!!!!!!!!!!!!!!! I got this awesome e-mail today from Laura Raphael, Children’s Services Coordinator at the library announcing and sharing the card design. Not only will 12,000 or so copies of “Please Louise” be given to every second grader in Tulsa and Tulsa County, this special library card will be available for all second graders to apply for. For many of them, it will be their FIRST library card in their names, so it’s a big deal! 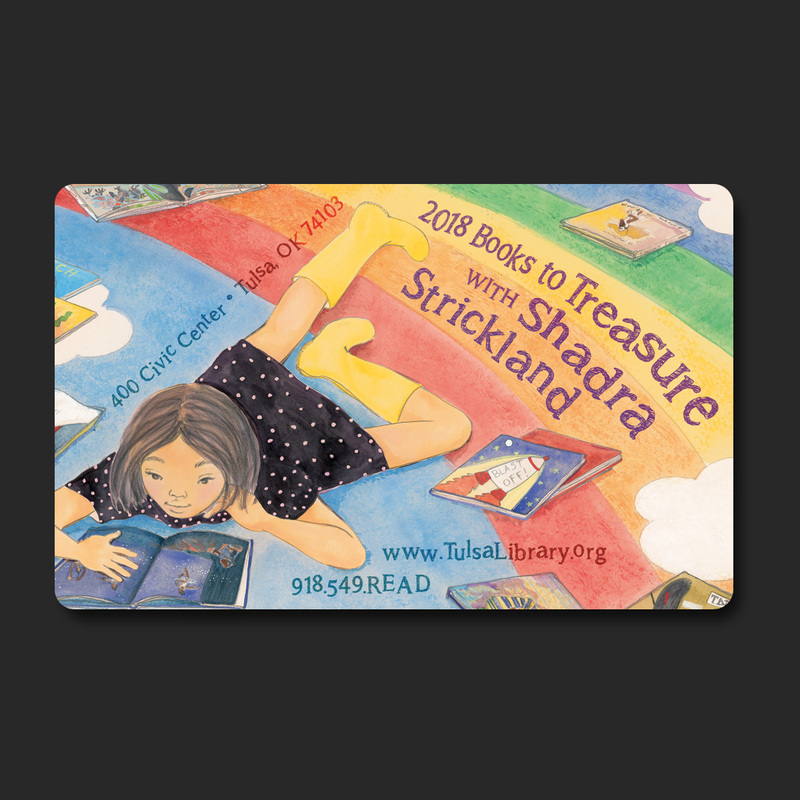 We typically have around 3,000 kids get the special Books To Treasure card every year. Since the program started 16 years ago, there are a number of BTT cards still being used by former 2nd graders. I can tell you from experience that there are young adults in their late teens and early 20s who still cherish their original Books To Treasure cards and don’t want to give them up! It’s always fun as a staff member to have someone hand you their library card and notice that it’s a BTT one. I am having one of my best weeks ever. Next year I will go to Tulsa to meet many of these awesome 2nd graders and receive my very own library card with Louise. I’m over the moon!